Educational DVD from top acro star and DHV test pilot Mike Kung. 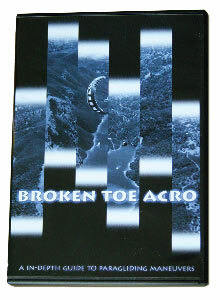 The current definitive acro and SIV DVD by the USA’s most famous SIV and acro instructor, Enleau O’Connor. Shot over the lake at the O’Connor’s flight school, where Enleau and his wife, Ann, have been running some of the most popular manoeuvres clinics in the States for many years, every manoeuvres and situation is broken down and explained in a mixture of dual-screen vision and personal explanation by the man himself. The action is fast and immediate, with a variety of on-board camera angles giving you a pilot’s eye view of what’s going on, backed up with a third person angle for greater clarity. The information is in-depth and presented in a comprehendible face-to-face manner that imprint the details of each situation indelibly into your mind. Broken Toe Acro is a veritable goldmine of information for anyone interested in either acro or SIV and is the kind of DVD you watch time and time again with your finger on the pause button.